Some software companies like do promotion activity including giveaway their applications, like Zonealarm did giveaway application last month. Now, EMSI Software company prepare to giveaway its anti-walware software on 11th November 2009 at 11:11 (Central European Time), this giveaway only open 24 hours. 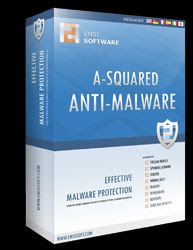 This application is A-Squared Anti-Malware 4.5 that costs $40 US dollars. If you want get this application for free you can go to this page on 11th November 2009.